Sylvester Stallone says he and his "Rambo" sequel movie crew recently witnessed the human toll of unspeakable atrocities while filming along the Myanmar (formerly known as Burma) border. "I witnessed the aftermath - survivors with legs cut off and all kinds of land-mine injuries, maggot-infested wounds and ears cut off," Stallone told The Associated Press in a phone interview Monday. "We hear about Vietnam and Cambodia and this was more horrific." The 61-year-old actor-director returned to the U.S. eight days ago from shooting "John Rambo," the fourth movie in the action series, on the Salween River separating Thailand and Myanmar, formerly known as Burma. Stallone said he was in Thailand for six months, most of it along or on the river. He sounds like Hannibal from the A-Team here. This was before the crackdown last week against the largest pro-democracy protests in Myanmar in two decades. After the government increased fuel prices in August, public anger turned to mass protest against 45 years of military dictatorship. Last week, soldiers responded by opening fire with automatic weapons on unarmed demonstrators. For decades, Myanmar's army has waged a brutal war against ethnic groups in which soldiers have razed villages, raped women and killed innocent civilians. The "Rambo" script, written long before the present Myanmar uprising, features boatman John Rambo - the Vietnam War-era Green Beret who specialises in violent rescues and revenge - taking a group of mercenaries up the Salween River in search of missing Christian aid workers in Myanmar. The character "realises man is just a few paces away from savagery when pushed." "I called Soldier of Fortune magazine and they said Burma was the foremost area of human abuse on the planet," Stallone said. Shots were fired over the film crew's head, he said. "We were told we could get seriously hurt if we went on." "I was being accused, once again, of using the Third World as a 'Rambo' victim. The Burmese are beautiful people. It's the military I am portraying as cruel," he said. 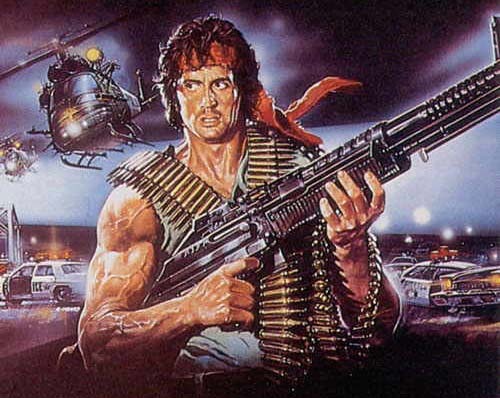 Stallone is now editing "John Rambo," which will be released in January.